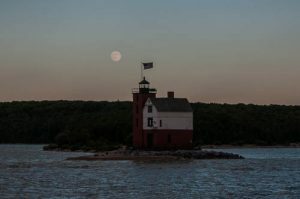 Sunset Cruise Surprise – Jenny and Jonathan Got Married! 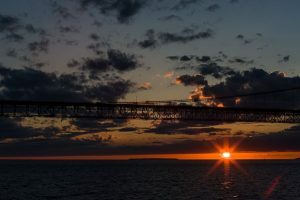 Here is a photo that Jonathan took during the Star Line Ferry’s Sunset Cruise under the Mackinac Bridge Monday night. This year, Jonathan and I took the 1.5 hour cruise for the third time. However, I chose this for my birthday. Mike Fornes, a local author of several books about the area, spoke over the boat’s PA system as the tour guide for all three of the cruises that we took. At the end of each cruise, he sits at the table by the gangplank to sign and sell his books. I bought two of his books on our first trip, but now each year I feel badly about not stopping to purchase anything. 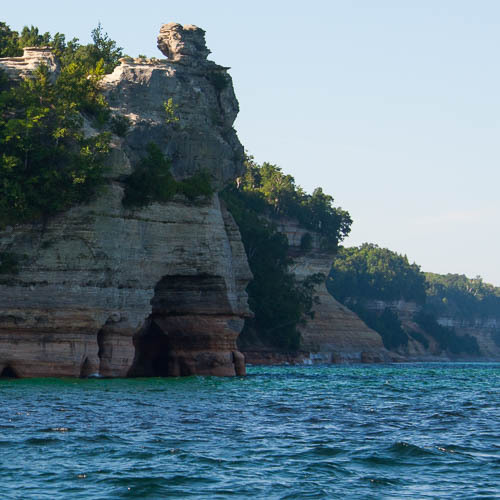 On Monday as the boat pulled away, he announced that he would hold a trivia contest at the trip’s end. This trivia contest had a very special prize. Trivia contest? This trip didn’t have a trivia contact last year! “I bet that the prize is books,” Jonathan deadpanned. The first name that Fornes called yielded no response. Forbes called the name of a young man. He asked the young man to come to the front of the boat with a guest of his choice. The young man brought a young woman with him. Everybody on the ferry clapped. I told Jonathan later that every non-engaged guy riding that boat with his serious significant other Monday evening now felt the pressure to step up. Not only to propose, but to craft a proposal with the same planning and element of surprise. 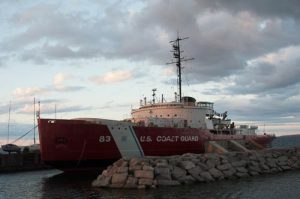 Here is the Coast Guard cutter.